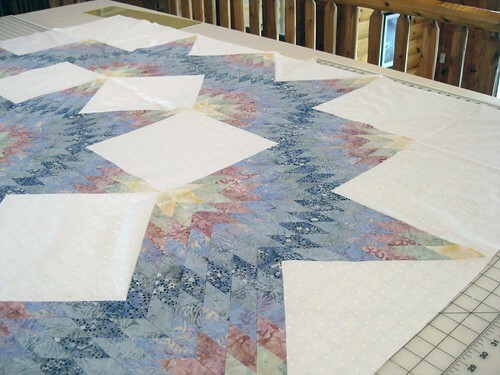 I finished piecing together the center of Marilyn’s quilt. 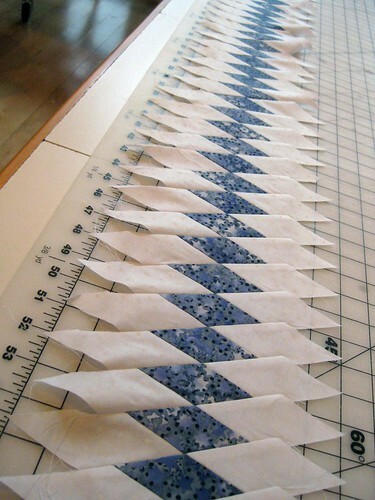 Now it needs an inner border of diamonds made of the primary dark blue fabric. Diamond units for the inner border. All four sides will require a total of 216 of these units, all pin matched. 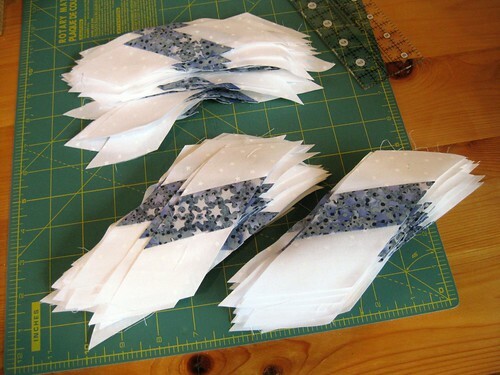 Enough diamond units sewn together for one side of the border. One of hese will be trimmed to a straight edge and sewn on each side. This entry was posted in Marilyn's Quilt, Quilting. Bookmark the permalink. TOTALLY AWESOME ! ! ! You have been a busy girl ! ! ! Your colors are beautiful, very soft and lovely. I’m impressed with your border, too. I just got EQ7 and am figuring it out. I think it would have helped me with my Lone Star borders. I wanted to do diamonds in the borders but couldn’t figure it out. Cheers to you!